Make where you stay a memorable part of your Granbury experience. No matter your vacation style, Granbury is home to stunning accommodations for every visitor. We wouldn’t be surprised if you extended your reservation upon arrival! All of our places to stay offer something for everyone! From authentic log cabins and historic bed and breakfasts to full-service luxury hotels, make your getaway one to never forget. Find a wide variety of lodging accommodations for individual travels, families, groups and couples. Interested in unique amenities such as staying in a historic home, a main-body lake view, or even a “haunted” stay? There is a place for you! 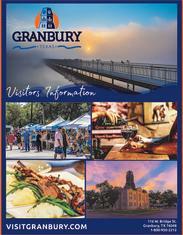 Download and print our "Great Stays in Granbury" PDF to find wonderful accommodations for your getaway.